It doesn't seem possible that our time in Guatemala is nearly over. We have just returned to the Sister Parish center in the heart of Guatemala City after a couple of days on the road. Marta Roja, one of the UPAVIMas, drove us through stunning scenery to Chichicastenango, a famous market town in the Quiché region, about 90 miles northwest of the capital. This is one of the centers of Mayan culture in Guatemala, so the visit gave us a chance to witness the resilience of the indigenous people in spite of the attempts to wipe it out during the civil war. Ellen, our Sister Parish coordinator, introduced us to Pastor Diego, who described how he established the Ruth and Naomi cooperative to help women devastated by the conflict to support themselves. We were taken to meet some of those women, who live on steep hillsides close to the small village of Chontolá, and whose houses could only be reached by narrow footpaths through fruit orchards and corn fields. After days amidst the diesel fumes of a crowded city, this simple walk with breathtaking views across cloud-capped mountains, was truly restorative. Once there, they showed us age-old hand-weaving skills used to produce a range of colorful crafts with designs typical of the region. Since they mostly only speak their native Quiché language, Ellen and Diego combined to provide two-stage translations of their inspiring story. Friday morning we woke up early and prepared for our trip to UPAVIM. The ride through downtown Guatemala City and into the outskirts of town (Zone 12) was scenic, and our tightly packed bus enjoyed the trip. When we arrived at UPAVIM, we were warmly welcomed by the UPAVIM women. We were then given a tour of the facility where we saw the school, the bakery, the library, and the arts and crafts work area. We had a huge lunch (that was quite delicious!) and then we were introduced to our host families. We all slept well and early on Friday night, and each had our own stories to share of the experiences we had at the houses. Almost all of the host families have children and large families, which makes evenings enjoyable and fun. Hola! Today was day two of our Guatemala mission, and we were exposed to a closer look at Guatemalan history and scenery. We started off the day with a representative from NISGUA (Network in Solidarity with the People of Guatemala), which is an organization that works for justice in Guatemala. Carrie came to the Sister Parish Center to help provide the DGFUMC delegation a better understanding of the history of Guatemala and the involvement that the United States had in the Guatemalan civil war. We learned that, in order to understand the present, a knowledge of the past is necessary. The 2011 DGFUMC delegation to our sisters in UPAVIM has arrived in Guatemala City. After an early morning flight from Chicago and a brief stopover in Houston, we landed safely in Guatemala City (with all our luggage) just after 1pm. We were greeted by a number of UPAVIMAs, including several who visited Downers Grove in 2009, waiting patiently outside with the Sister Parish coordinator, Ellen Moore. The value of our hermanamiento was once again demonstrated by the warmth of their welcome, whether renewing past friendships or meeting new faces. This is a relationship that is enriching both communities, and we are excited that it is being refreshed once again. Thank you for all your prayers and good wishes. We will try to post messages whenever we have access to the internet. You can follow our progress on the Guatemala blog. You can be in ministry with our Guatemalan mission delegates as they travel to Guatemala City July 6-14 to deepen our friendship with UPAVIM, our sister organization. How? By being a letter or prayer sponsor. To be a letter sponsor, simply write a note of encouragement that the delegates can open and read each day they are there. Notes need to be turned into the church office by July 3. Or email Sharon to have her print your note for the delegates. To be a prayer sponsor, commit to pray for our delegates on any of their mission days. This year’s delegates are Barb Ehst, Debbie and Lexie Faber, Claire and Stephanie Marich, Ina, Ray and Louise Osborn, and Emily Stuba. Please also pray for the women of UPAVIM as they work to bring hope and services to the people of their impoverished neighborhood, La Esperanza. It is a wonderful opportunity to encourage their work and stand beside them as they struggle for a better life. There’s another chance to buy beautiful handmade crafts made by the women from our hermanamiento, UPAVIM, who live on the outskirts of Guatemala City. There will be colorful bags, scarves, kitchen items and, for the first time, jewelry. Stop by our table in the Parlor on Sunday, April 17th and Sunday, May 1st to pick up a gift for Mother’s Day, teacher appreciation, birthdays and graduations, or treat yourself! The sale of these crafts helps the women to build better lives for themselves and their community funding a school, a clinic, a bakery and soy milk production. The profit we make will help fund a visit to the women in July this year. We have seven people interested in forming a delegation to visit Guatemala City from July 6-14th. Contact Ina and Ray Osborn (630.515.8418) if you are interested in joining us on this mission trip in July. We send a warm greeting from ALL THE WOMEN OF UPAVIM. Our hearts are filled with joy when we hear that you are well. How good to know that winter has passed. It fills us with enthusiasm to know that you support our project with the laboratory. We trust in God that we can open it to the community soon. Thank you. We are here in very hot weather working for our community and our families. Let’s keep praying together that peace will not cease in the world-- in all that is happening in it. Read more about Guatemalan Crafts Are Back! We are excited to announce that we plan to send a delegation from our church to visit the women of UPAVIM in Guatemala City this summer. The visit will take place from July 6th through the 14th. Ray and Ina Osborn, who participated in the 2008 delegation, will be leading the group and we hope to encourage anyone who is interested in developing our relationship with these remarkable women to join us. Under-18s need to be accompanied by a parent and we already have a family considering this; you do not need to know Spanish as a translator is provided. Most of the cost of the trip is covered by fundraising that we’ve already done, but participants will be asked to fund their own airfare and some expenses, which will amount to around $550. This is a different kind of mission trip where we offer ourselves and our friendship rather than our building skills and material wealth. During our time in Guatemala, we will spend a few days living in the homes of some of the women, discovering the delights of their culture and the hardships of living on the margins of society. We will witness their courage, strength and faith in God and we will be changed! In the past few years, we have begun to share how we can work together to build a better world and we are working on a joint project to help the women reopen their medical laboratory at the clinic within UPAVIM. Please give prayerful consideration to the idea of joining us in July. A meeting to share further information for those who are even a little interested will be held on Sunday, March 6th at noon in room 213. Or contact Ina or Ray for more information. A delegation from our church will visit the women of UPAVIM in Guatemala City from July 6th through the 14th. This is a different kind of mission trip where we offer ourselves and our friendship rather than our building skills and material wealth. During our time in Guatemala, we will spend a few days living in the homes of some of the women, discovering the delights of their culture and the hardships of living on the margins of society. We will witness their courage, strength and faith in God and we will be changed! In the past few years, we have begun to share how we can work together to build a better world and we are working on a joint project to help the women reopen their medical laboratory at the clinic within UPAVIM. Ray and Ina Osborn, who participated in the 2008 delegation and will be going again this year, will lead an informational meeting on Sunday, March 6. Under-18s need to be accompanied by a parent and we already have a family considering this; you do not need to know Spanish as a translator is provided. Most of the cost of the trip is covered by fundraising that we’ve already done, but participants will be asked to fund their own airfare and some expenses, which will amount to around $550. Anyone who might be interested in join in this mission or just wants to find out more is invited to attend. 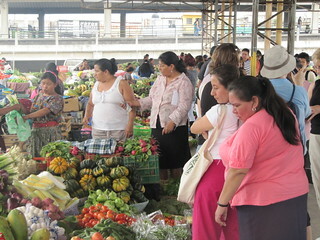 The women of UPAVIM in Guatemala City have given us a great new way to keep in touch with them! You can read their first newsletter online with details of their current projects, including the construction of a new floor that will help them set up a new program for the elderly, exciting news of their first college graduate, and new photos. During Advent last year, many of you stopped by our table in the Parlor to look at and purchase some of the beautiful handmade crafts made by the women of UPAVIM. It was also a wonderful opportunity for those of us selling the crafts to share our experiences of our visits to Guatemala City and our relationship with these women. 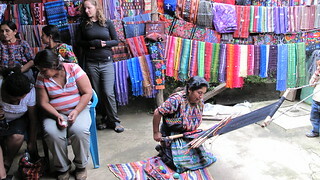 Some of you were able to purchase something made by one of the women you’d met when they visited us in November 2009. I hope that you and your friends who received these gifts are enjoying using them knowing that they have made a difference in the lives of the people of La Esperanza, a slum on the outskirts of Guatemala City where UPAVIM runs its cooperative. For many of the women, the income from the craft making is the only support for their families. Thank you for your support in raising $2,500 toward our mission.